A seventh visit to the Festival ended in another victory for Buena Vista, who won the Pertemps Final for the second year. Trainer David Pipe said the ten-year-old could well be back for the race in 2012, when he would bid to emulate Willie Wumpkins, winner three times from 1979 to 1981 under amateur Jim Wilson. Conor O’Farrell rode Buena Vista, who last year was partnered by Hadden Frost. Pipe said: “Why not aim to come back again? He’s won off 138, and I thought from that mark he had a lot to do, so we put Conor on to take 5lb off his back. “For the last two years the ground has come right for him, but he’s always been a class horse. He’s been in very good form at home, but you wouldn’t expect a ten-year-old to be improving. “Why hasn’t he won this season? He’s been running on soft ground, and simply can’t perform on it. He ran a cracker on good ground over fences at Wincanton when second off a mark of 133, but they put him up to 140 so we had to go back hurdling. “It’s a superb tribute to the horse that he’s come back to the Festival seven times, and been placed in the Supreme, placed in this race, and now the winner twice. He got a great reception from the crowd, but that is what you get in National Hunt racing. Twenty-one-year-old Conor O’Farrell had a dream introduction to Prestbury Park, steering the David Pipe-trained Buena Vista to the horse’s second consecutive victory in the Pertemps Final. O’Farrell, from Co Kilkenny, said: “This is unbelievable, it’s my first ever ride at the Festival. Mr Pipe’s been very good to me since I came over from Ireland. He’s given me some great opportunities and I’m glad to be able to take advantage of them. A graduate of the Kildare Racing Academy, O’Farrell worked for John ‘Shark’ O’Hanlon and rode out for Charlie Swan before joining the Pipe stable last November. Ten-year-old Buena Vista was ridden to victory last year by Hadden Frost, who was also enjoying his first Festival win. The Pertemps Final (Handicap Hurdle) was introduced to The Festival in 1974, replacing the George Duller Handicap Hurdle. Until 1993, it was run under the Coral banner. Other sponsors since then have been American Express (1993), Hamlet Cigars (1994 & 1996), Astec Vodafone (1995), Hamlet Extra Mild Cigars (1997), Unicoin Homes (1998) and Stakis Casinos (1999). Ladbrokes inherited sponsorship in 2000 after acquiring Stakis Casinos and Pertemps took over in 2002. The Pertemps Final (Handicap Hurdle) is the final of the Pertemps series. Nine qualifiers have been scheduled this season at Cheltenham (October 15), Kempton (November 1), Auteuil (November 7), Exeter (November 19), Sandown (December 4), Cagnes Sur Mer (December 20), Wincanton (December 26), Leopardstown (January 9), Cagnes Sur Mer (January 9), Warwick (January 15), Pau (January 16), Huntingdon (January 26), Punchestown (January 30), Pau (February 4), Carlisle (February 9) and Haydock (February 19). The smallest field was 17 in 1976 when Good Prospect won at 10/1. Willie Wumpkins won in three consecutive years from 1979-81 when 11,12 &13. He died in 1995 at the ripe old age of 27. Forgive ’N’ Forget is the only totesport Cheltenham Gold Cup winner to have won what is now the Pertemps Final, beating 22 rivals in 1983 and going on to take the Gold Cup two years later. 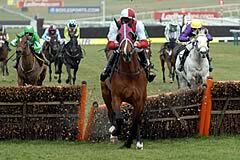 There have been two 50/1 winners in the past six years, with Creon in 2004 and Kadoun in 2006 scoring for the bookies.